Umesh Yadav sounded dejected in a recent interview when he was questioned about his intermittent appearances in international games. He was unhappy about the fact that he is not given sufficient chances and is benched in many matches. The Indian cricket team is probably in its best phase ever right now, and has managed to manifest the right balance across all formats. And with Jasprit Bumrah, Mohammed Shami, Ishant Sharma, and Bhuvneshwar Kumar in the squad, Umesh has either played second fiddle or hasn't played at all. Lethal pace and reverse swing are Umesh's fortes. He has the build for bowling long and relentless spells at a brisk pace, but sometimes he struggles to find his rhythm in that early stages, which is probably what has caused his ouster him from the national team. Umesh was part of the Indian team on the tour of South Africa but didn't get to play any game. He was sent on the tour to England for a 5-match Test series but only featured in one Test, at Birmingham. He played the Perth Test but was benched in the remaining three Tests of the recently concluded series in Australia. However, he proved pivotal in India's win over West Indies in the home series last year, totally uprooting the Windies batting line up with his reverse swing. In the last Test in Hyderabad, he picked up 10 wickets on a dead track to complete the 2-0 series win. Umesh was a regular feature of the ODI squad until a couple of years back. However, he failed to hold on to his place in the team and hasn't featured in many limited-overs games in the last year. In 2018, he appeared in only 4 ODIs and 5 T20Is for India. He wasn't picked for the ODI series in Australia and New Zealand, and that possibly eliminates his chances for the upcoming World Cup in England. Constantly going in and out of the national side with very few games in his kitty, it must have been difficult for Umesh to route back to domestic cricket. After playing years of international cricket, players often find it difficult to play domestic fixtures as they lack the same level of intensity. Umesh had indicated that the constant shuffling in the national side was disappointing and often left him unmotivated. However, following the advice of his mentor and RCB coach Ashish Nehra, Umesh returned to the domestic circuit with a commitment to burn the midnight oil and help himself regain his lost position in the national side. 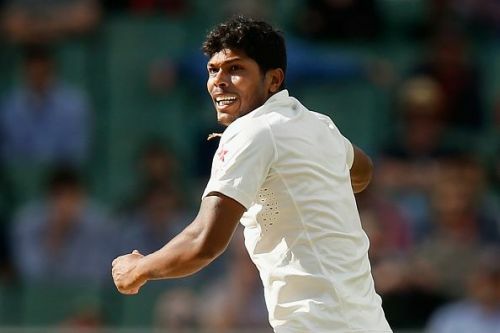 Umesh blasted off with match-winning performances in his first two appearances of the season. As expected, he didn't shy away from taking the responsibility of leading a young Vidarbha bowling attack, and has claimed 21 wickets in his two Ranji games this year. His clinical performances against Uttarakhand and Kerala in the quarter-final and semi-final respectively helped Vidarbha make their way into the final of the Ranji Trophy, their second in successive seasons. Umesh has looked upbeat since his return. He ensnared 9 wickets against Uttarakhand and 12 against Kerela. The latter was his second 10-wicket haul in first-class cricket, and he was adjudged 'Man of the Match' in both the games. On the other hand, Cheteshwar Pujara has brought together all his experience to help Saurashtra storm into the finals. The Ranji trophy final this year could be titled as a clash of titans as both the teams are ready with their best arsenal and would not leave any stone unturned to lift the cup. Vidarbha's reliable batting veteran and run-scoring machine Wasim Jaffer has churned out runs magnificently, and would try to carry forward his form into the final. Vidarbha are the reigning champions of Ranji Trophy and would want to win it this time again. The return to domestic cricket might have felt sour to Umesh at first, but this could prove life-changing for him. Despite the presence of Vidarbha's last year's hero Rajneesh Gurbani and stalwart Wasim Jaffer in the side, Umesh has a major role to play. And if he succeeds in doing what is expected of him, his return could prove to be a turning point in his career.